The November edition has an excellent step by step description on how to cook a whole chicken with vegetables to complement it. She steps the reader through the ingredients needed, vegetable preparation, seasoning, basting, cooking, a little on chicken stock, and the difference between cooking a store bought vs heritage breed chicken. This is a valuable resource for us since we are preparing to raise chickens in the spring for eggs, our meat, and some for sale. Other topics for this month’s edition include information on planning your garden’s bed rotation, storing water for emergency power outages, and diversifying your income by starting a small sideline business. The Walden Effect, The Chicken Blog (another one of their blogs), and the Weekend Homesteader ebooks are resources I read and reference regularly. 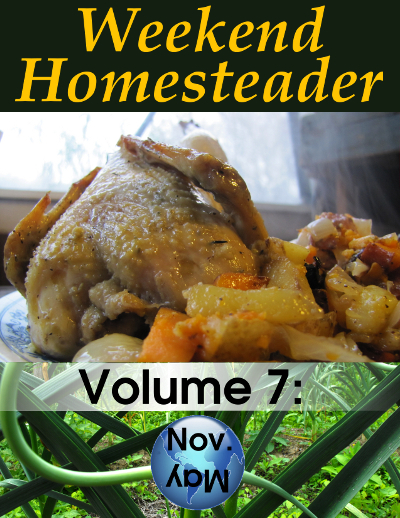 If you want an informative and entertaining source on homesteading, check out their sites and check out some of the Weekend Homesteader ebooks below.